Need a quicker way to transfer data between computer locations? Perhaps you have files that are constantly shared? A server is your best way of keeping shared data in one safe location, allowing others to access the files without them getting lost on personal, or office PC’s. 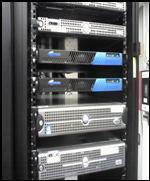 We have certified and experienced Technicians that can build the right server for you!